Do your invoicing with software that works well with your MacBook. Track time for your projects, create professional invoices, send payment reminders, and do a lot more. Try Zoho Invoice and enjoy hassle-free invoicing. You're used to your work happening effortlessly with Mac, so you want invoicing software that is just as easy to use. With Zoho Invoice, you can create and send invoices in no time for a seamless experience. Excellent UX with extensive features makes you a Mac loyalist. Ensure that your invoicing software offers the same. Zoho Invoice lets you handle project invoicing, track time, and manage expenses, all from one place. Zoho Invoice's desktop timer ensures that your work gets your undivided attention. Just start the desktop timer when you are working on your project, then sync your timer with the web app to capture your worked hours and bill your clients. You don't have to figure Zoho Invoice out on your own. Our customer support team is there for you from start to finish, for service that's as reliable as your Mac. Manage your invoicing on the cloud, just like you manage your files on iCloud. Zoho Invoice is available on iPhone, iPad, and the web, helping you take care of your business from anywhere. 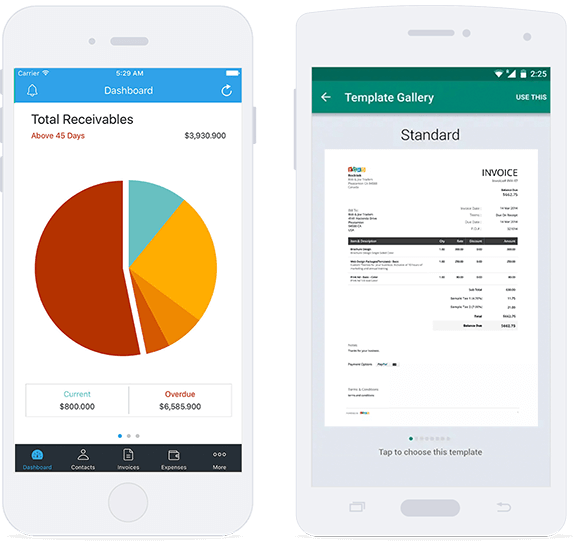 Zoho Invoice provides a convenient client portal for your customers to view their invoices, update their billing information and pay for the invoices. With Zoho Invoice you can automate the sending of your invoices. You can also set up recurring invoice profiles so that you don'y have to send invoices manually for repeating invoice schedules. Zoho Invoice offers multiple payment options through which your clients can pay for the invoices, including cash, credit card, and cheques. It also supports 10+ payment gateways. "So you don't have to worry about your invoicing while on the move." Zoho Invoice, designed for your Mac.